Im sorry that you feel it wasnt worth the trip. Yes we were 10mins late due to the rough seas getting back to port. The bait camp was closed and could not get the bait we usually get. As for the boat that is the normal 23ft size boat that is used in the United States for bayfishing and my instruments work fine. 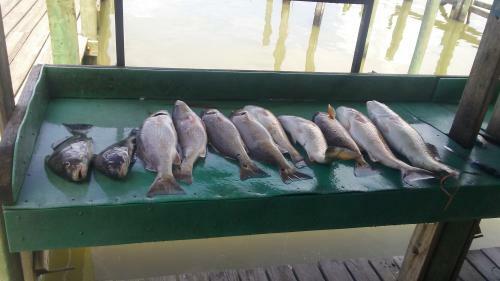 The trip to kemah was only 12 mins and we were fishing within a hour of our departure. The seas were rough and i was going to cancle the trip but i reluctantly took ya out. Luckly the weather improved enough for us to catch fish and i extended your trip time. Once again im sorry you had a bad experience. 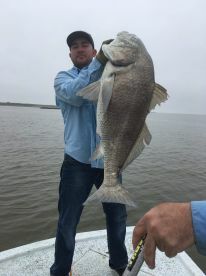 The fishing was alright, but the trip was very unorganized. Just to find bait took almost an hour to get there then backtracked to fishing spots. The trip included lunch but the resteraunt we were supposed to go to had not been open in some time. Lost more time looking for somewhere to eat. 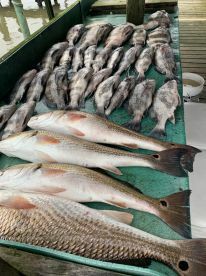 We caught 20+ fish and the captain said he would clean and ship the fish home to us but after 2 weeks we have not seen anything of them. Haven’t been able to contact captain to check on shipment. Would not recomend spending $700 on this trip. Thank you im glad were able to make your trip adventurous and satisfying. I hope we get to take yall out again. Awesome trip, catered to every request and put me on the fish at every drop of the anchor. Will definitely go with this guide service next time I am in the area! Captain David put us on the fish at many different locations. 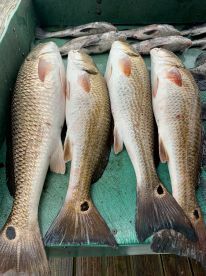 We ended up with some beautiful Redfish keepers.